The scenic picture here is of Roger Federer on the main practice court at the Indian Wells Tennis Garden two weeks ago. This year’s BNP Paribas Open had some oddly cool, rainy weather, an invasion of moths and the loss of Rafael Nadal (injured knee) for the highly-anticipated semi-final against Federer. But everything else was terrific, especially plenty of compelling matches capped by thriller, go-the-distance victories in the finals by Bianca Andreescu and Dominic Thiem. Both Andreescu and Thiem were impressive in their respective championship matches against more accomplished opponents – Angelique Kerber and Federer. At this week’s second half of the yearly ‘Sunshine double’ at the Miami Open, it will be difficult to match the drama and excitement that happened in the California desert. It will be pretty well the same player fields in the men’s and women’s events – with Nadal (and compatriot Pablo Carreno Busta) out of the men’s draw but with Indian Wells absentees Kevin Anderson and Grigor Dimitrov appearing in Miami. All of the top 32-ranked women are in the women’s event. Madison Keys, seeded No. 17, has only played two 2019 tournaments – Australian Open and Indian Wells – due to injuries, and her record is just 3-2. In the video below she gives a look at the new centre court using mostly football stadium seating, some of it with a steep incline. Although several women’s first rounds are being played on Tuesday, Andreescu will not start until Wednesday against No. 70-ranked Irina-Camelia Begu of Romania, the same opponent she defeated in the first round in Indian Wells 6-7(3), 6-3, 6-3. Then it could be No. 32 seed Sofia Kenin, the last woman to beat her – 6-4, 3-6, 6-3 in the Acapulco semi-finals three weeks ago. The 8th-seeded Kerber, if she beats a qualifier, could be waiting for Andreescu in the third round for a rematch of Sunday’s Indian Wells final. 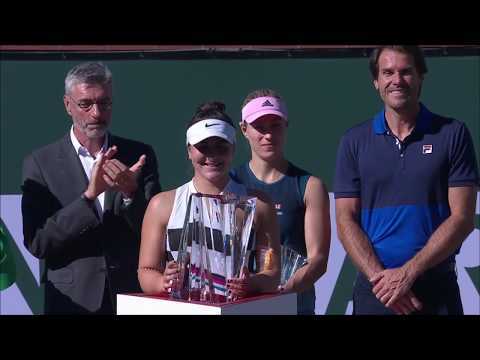 It will be a tough test for the 18-year-old Andreescu because she will have to come back to earth after the high of her sensational win at the BNP Paribas Open. Milos Raonic, seeded 12th, reached the Miami Open quarter-finals a year ago before losing 5-7, 7-6(1), 7-6(3) to eventual runner-up Juan Martin del Potro. This time he has a bye and begins against either No. 101-ranked Maximilian Marterer of Germany or American Taylor Fritz, No. 56. Then it could be 19th seed Kyle Edmund possibly followed by ninth-seed and defending champion John Isner in the round-of-16. Top-seeded Novak Djokovic is his intended quarter-final opponent. At the Miami Open, Raonic has never lost his opening-round match and has a record of 14-5. His best finishes are quarter-finals in 2014, 2016 and 2018. He withdrew due to injury after one match in both 2013 and 2017. Denis Shapovalov reached the fourth round a year ago before losing 7-6(2), 4-6, 6-4 to Borna Coric. As the No. 20 seed, his path this year begins with a bye and then the winner of No. 59 Malek Jaziri of Tunisia and a qualifier, then a possible rematch of his 6-4, 6-2 Indian Wells win over No. 9 seed Marin Cilic in the third round. If they both get to the round-of-16, there could be an appetizing popcorn encounter for Shapovalov against old junior rival and No. 8 seed Stefanos Tsitsipas. In the quarter-finals, he’s slated to meet No. 2 seed Alexander Zverev. Félix Auger-Aliassime won his opening round of qualifying on Monday by a 4-6, 6-4, 6-1 score over No. 145, the 6-foot-6 Italian Luca Vanni. In Tuesday’s second and final round he faces another Italian – No. 107 Paolo Lorenzi, 37 – in the day’s first match at 10 a.m. on Butch Buchholz (4th largest) Court. The 18-year-old Auger-Aliassime, now ranked No. 57, will hope to qualify and play in his fifth Masters 1000 event – Indian Wells ’18, Monte Carlo ’18, Rogers Cup ’18 and Indian Wells ’19 and has a 4-4 record. Also in Monday’s qualifying, No. 62-ranked Mackenzie McDonald of the U.S. defeated Peter Polansky 7-6(4), 7-5 and No. 117 Nao Hibino of Japan beat Genie Bouchard 4-6, 6-0, 6-4. Among the more fascinating potential early-round Miami Open matches are a possible second-round clash between Djokovic and Tomas Berdych and potential third-round meetings between Shapovalov and Cilic (for the second tournament in a row) and Federer – Stan Wawrinka (also for the second tournament in a row) as well as Kei Nishikori vs. Nick Kyrgios. In the women’s draw there’s that possible Andreescu – Kenin in the second round and maybe Andreescu and Kerber in the third. Also there could be a Garbine Muguruza – Caroline Wozniacki match-up in the third round as well as another third-rounder between Serena Williams and Wang Qiang. The players with the most to lose in ranking points would appear to be last year’s champions – Sloane Stephens and Isner, as well as runners-up Jelena Ostapenko and del Potro. None will suffer too badly with Stephens possibly dropping from No. 6 to No. 8 if she doesn’t perform well and Ostapenko going from No. 23 to No. 31 if she loses early. As for the men, Isner could fall from No. 9 No. 12 and del Potro, absent with a knee issue, will probably remain steady at about No. 8. What kind of indicators have the champions of Indian Wells and Miami been over the past 25 years at predicting Grand Slam tournament success during the rest of the year? Well, the men’s champions at Indian Wells have gone on to win 17 Grand Slam titles the same year they won in the California desert while Miami winners have only had 12 Grand Slam successes in the months following the south Florida event. It’s quite the opposite for the women over the past quarter-century, with Indian Wells champions going on to win a total of eight Grand Slam titles the rest of the year while Miami winners scored 22 Grand Slam championships following their success in south Florida. It’s worth noting that Serena (8) and Venus (3) Williams won 11 Miami titles between them – and only two (Serena in 1999 and 2001) at Indian Wells. They were based in south Florida not far from Miami so that made the neighbouring event easy for them. As for Indian Wells, after an incident in 2001, they boycotted from 2002 to 2015. Between them they went on to have 12 Grand Slam successes in the year following the Miami event but only one after victories at Indian Wells – by Serena in 1999. The most obscure, or maybe the better word for it is unlikely, women’s winners of each event would be Russian Elena Vesnina at Indian Wells (not counting Bianca Andreescu in this unfinished year) in 2017 and Johanna Konta of Britain in Miami that same year. On the men’s side it would be Ivan Ljubicic (2010), the only Indian Wells winner in 25 years not to at least reach one Grand Slam final. It’s the same in Miami with Nikolay Davydenko, champion in 2008, also never being a Grand Slam finalist. TSN begins its coverage of the ATP portion of the Miami Open on Wednesday at 11 a.m. ET and RDS has its coverage in French at 2 p.m. on RDS2 also on Wednesday. Unfortunately, as with Indian Wells, there’s no Canadian television of the WTA Miami Open tournament. Time flies – it’s hard to believe that Roger Federer’s identical twin daughters – Charlene and Myla – will be 10 in July and his non-identical twin sons – Lenny and Leo – turn five in May. Here the boys, and it appears one daughter, can be seen in Stadium 1 at the BNP Paribas Open last week. Notice Leo and Lenny are wearing identical but non-logo outfits. Memorial University heading to Nationals!